A find in a charity shop opens the door to a world. A little preserve pot I bought for £3.50 in the shop of the Hospice of St Francis revealed to me a group of unrecorded studio potteries in the Cotswolds, little connected to art schools and making pots in the country tradition. I bought the pot just because it was nice, obviously made by hand and decorated deftly with slip. The method of slip method was described in my recent post about Mary Wondrausch, the potter who brought slipware back into prominence. 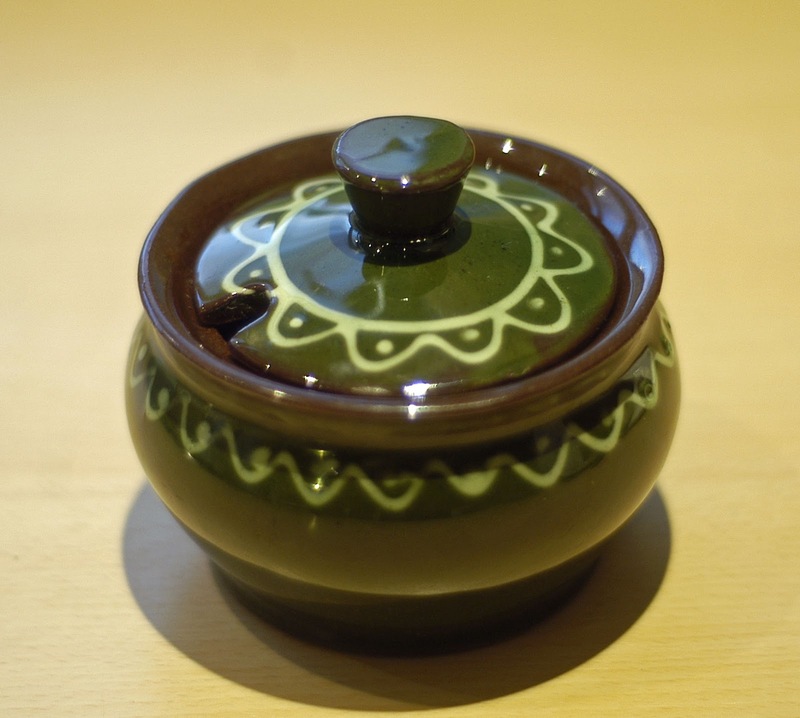 Slipware, she said, is lead-glazed earthenware decorated with coloured “slip”, which is clay mixed with water. The main methods are trailing a line of slip through a fine tube, scratching through a slip of one colour to make a line of a contrasting colour by revealing the clay beneath, or painting. The pot (below) was practical too, just the right size to bring jam to the table, and with a shiny glaze that made washing up easy. Found in a charity shop. I had no idea who made it or where it came from so I asked on Facebook. John Jelfs, an experienced potter who runs the Cotswold Pottery, told me it was made down the road from him in the Broadway Pottery in the 1960s. Broadway was one of many good potteries that were never recorded in the histories of studio pottery because they fall outside the studio pottery canon established by Muriel Rose, Paul Rice and Oliver Watson. Anyway, with the best will in the world, there are too many for all of them to be mentioned. 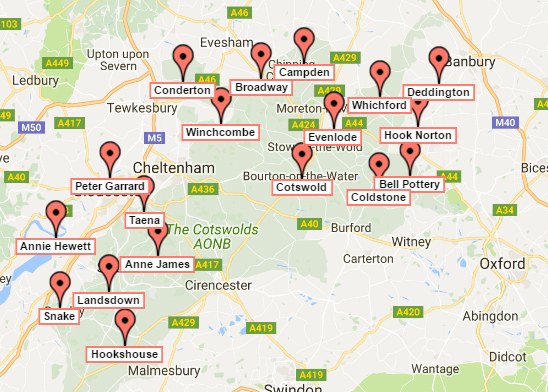 The Cotswolds is a popular place for studio potteries. Since the war about twenty have been set up in an area about 20 miles square roughly bounded by Worcester, Banbury, Oxford and Stroud, not including those making transfer-printed pottery and “have-a-go” pottery-painting shops. 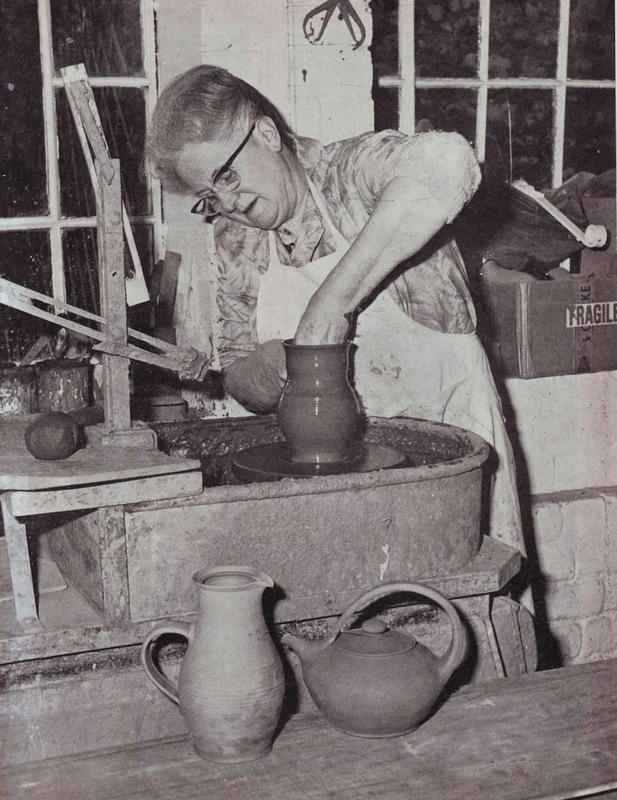 More than half the studio potteries were set up between 1960 and 1979. Here is a map showing where they are (or were – several of them have closed). There were two waves. The earlier studios formed before 1968 – Winchcombe, Taena, Coldstone, Broadway, Snake, Campden, Evenlode and Deddington – were traditional in method and conservative in style. 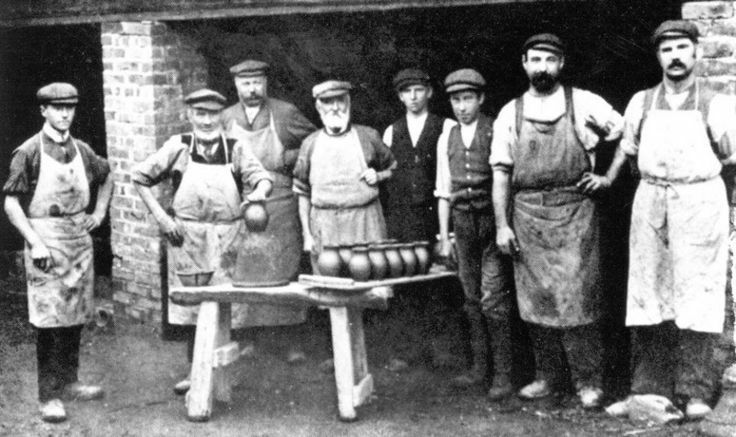 The potters trained with other potters rather than at art school. The more recent ones – Bell, Hook Norton, Cotswold, Hookshouse, Anne James, Whichford, Conderton, Annie Hewett, Landsdown and Peter Garrard – were set up by art school graduates and their work is more innovative. 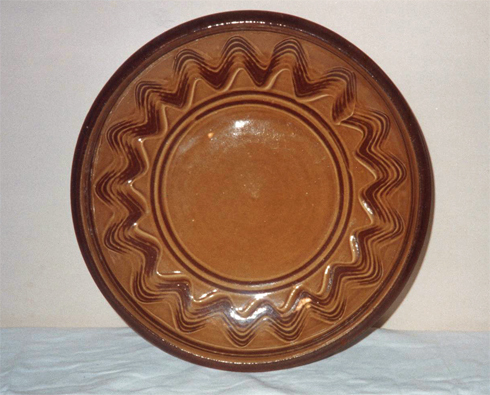 The first wave all worked in slipware, although Winchcombe later went over to stoneware. They were like old country potteries even though they made for tourists rather than farmers. They are absent not only from the general histories but also from Mary Wondrausch’s, Victoria and Michael Eden’s and John Matthieson’s books on slipware pottery, which the authors thought had died out in Britain until artist potters brought it back in the last quarter of the twentieth century. But while the Cotswold slipware makers are not well recorded, there is a trade in their pottery among collectors and it is now visible on the internet. The educated founders of the studio pottery movement, particularly Bernard Leach and Michael Cardew, admired the country potters. Their ideal was Edwin Beer Fishley, the old Devon potter. Cardew was told by a traditional potter, “It’s a foolish idea for someone like you to try to be a potter. It’s too hard for a gentleman.” Cardew tried to prove him wrong by making slipware pots in the country tradition, but he never quite ceased to be a gentleman. Sidney Tustin, the working-class boy who came to assist him, was never allowed to make big pots, a task Cardew reserved for himself. Ray Finch, who was also a gentleman, called Cardew “Michael”, but the other assistants at Winchcombe called him “Sir”. The studio potters were now bound to be artists not peasants. Dora Billington, who taught studio potters for forty years at the Royal College of Art and the Central School of Arts and Crafts, put it like this: “The studio potter today is not and cannot be just a peasant potter; books, museums, travel have brought to his notice the pottery of all ages and places, widening his knowledge and experience, and bringing the eclecticism inescapable to our generation. No longer are the established standards accepted without question.” But the rural location of the Cotswold slipware potteries, their absence (Winchcombe aside) from written history and their inheritance of traditional techniques link them to the country potters erroneously described as “peasants”. The Cotswolds does not have a strong pottery tradition like Devon and West Yorkshire and the influence of country pottery came at a distance, from studio potters who were aware of slipware and imported its methods. They all sprang ultimately from Winchcombe. The attraction of the Cotswolds to studio potters came from its pleasant environment and the Arts and Crafts tradition established in the early 20th century by the settlement in the area of Ernest Gimson, Ernest and Sidney Barnsley, Alfred and Louise Powell and C.R.Ashbee, all to some degree inspired by utopian ideas. The drift to the Cotswolds was part of a wider disillusionment with urban, and particularly suburban, life. Although the Arts and Crafts movement was mainly an urban phenomenon, its ideals were rustic, and William Morris’s opinion that “God made the country, man made the town and the Devil made the suburbs” won wide assent. To some degree the incomers constructed rural life according to backward-looking preconceptions. In the early 20th century, the Cotswolds, for all its beauty, was a depressed industrial area. As Tanya Harrod notes, “The emptiness and relative poverty of the Cotswolds enabled creative men and women both to reinvent the countryside and, with the confidence of Empire builders, even to teach its inhabitants how to be country folk.” Cardew and Finch, both Londoners, reinvented the country pottery. The Cotswold slipware potters moved from one workshop to another, so the potteries are connected. Chris Harries worked at Winchcombe from 1948-51, then he set up Coldstone in 1953. Dieter Kunzemann worked with him until 1967, then he set up Evenlode. Muriel Tudor-Jones worked at Coldstone, went to Broadway in 1959 and set up Campden in 1963. Jo Berryman went from Coldstone to Campden and set up at Deddington in 1967. Taena, set up in 1948, was rather out of the mainstream. They were a Christian community and pottery, made by Lewis “Loo” Groves and Margaret Leach, was only one of their activities. Peter Brown, the sole potter at Snake Pottery, was also out of the mainstream. He was self-taught and is better known for his novel Smallcreep’s Day. Preserve pot by Sid Tustin, Winchcombe. The prototype of the Cotswold pottery preserve pot. The influence of Winchcombe is seen clearly in the dishes of Coldstone and Evenlode and the preserve pots of Broadway, Campden and Deddington. Chris Harries’s wheatear decoration was continued by Dieter Kunzemann, Jo Berryman and James Brooke. These were potteries in which conservation rather than innovation was the important thing. A mug by Peter Brown. 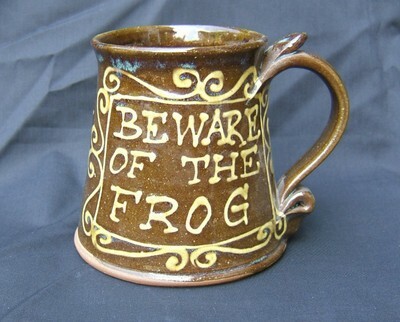 Based on C17th slipware, these mugs had a moulded frog inside. John Harlow, an assistant at Coldstone, described it. 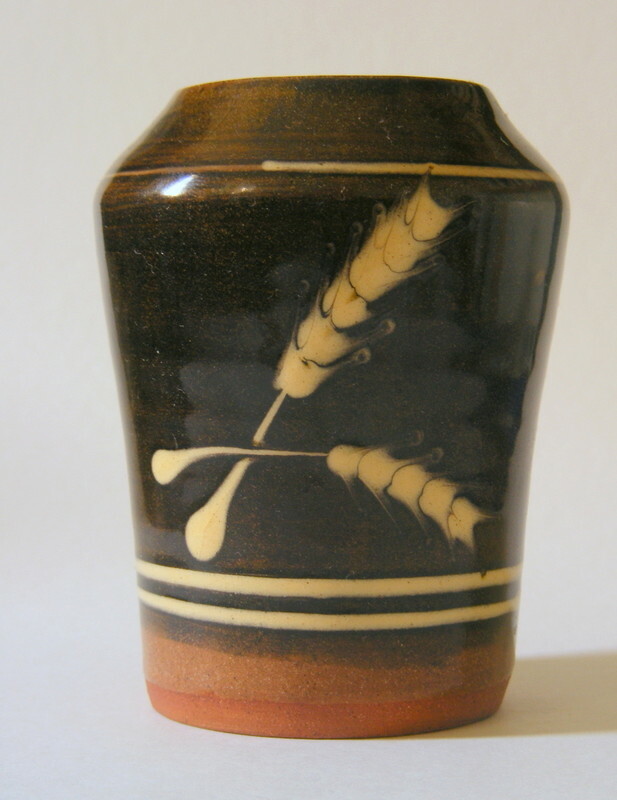 Chris Harries came to pottery in middle age after working as an accountant. He and his daughter Dinah were dish-makers. The throwers at Coldstone were Gordon Plahn (1955-6), John Shelley (1956), Muriel Tudor-Jones (1957-60), Dieter Kunzemann (1957-68), Jean Halstead (1960-3), Jo Berryman (1964-5), John Harlow, David Goldsmith, Hugh Allan, Michael Dixon and James Brook. There were local helpers as well: Mrs Tait and Mrs Shirley, who packed the big kiln, Mrs Tucker, who made dishes, Harold Shayler, who pugged the clay, and Mr McKnight, the packer. (Ceramic Review, No. 158, March/April 1996, p. 9) Harries’s ambition may have been satisfied by the mention of him in a history of the old country potteries alongside such characters as Fishley Holland, Isaac Button and George Curtis. 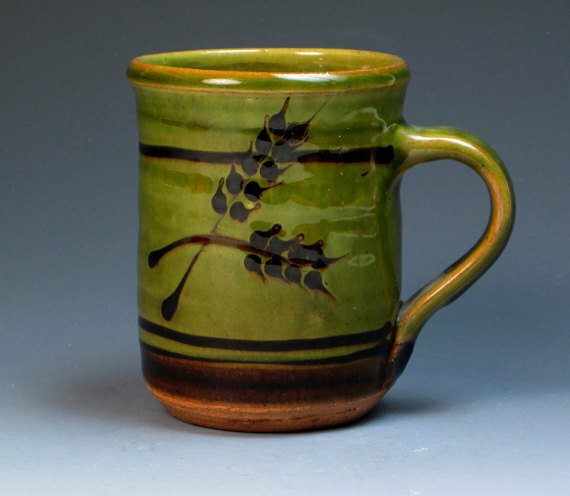 Mug by Dieter Kunzemann with his characteristic wheatear motif. 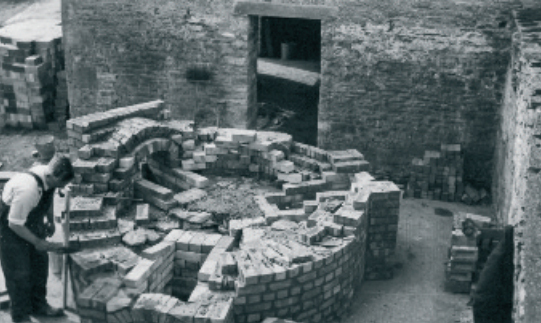 The Ascot Grapevine, a local community magazine, published this picture of the Coldstone kiln under construction by Eric Moss, a local builder, in about 1952. It is a large updraught kiln characteristic of English country potteries and untypical of studio potteries. Coldstone kiln under construction, 1952. 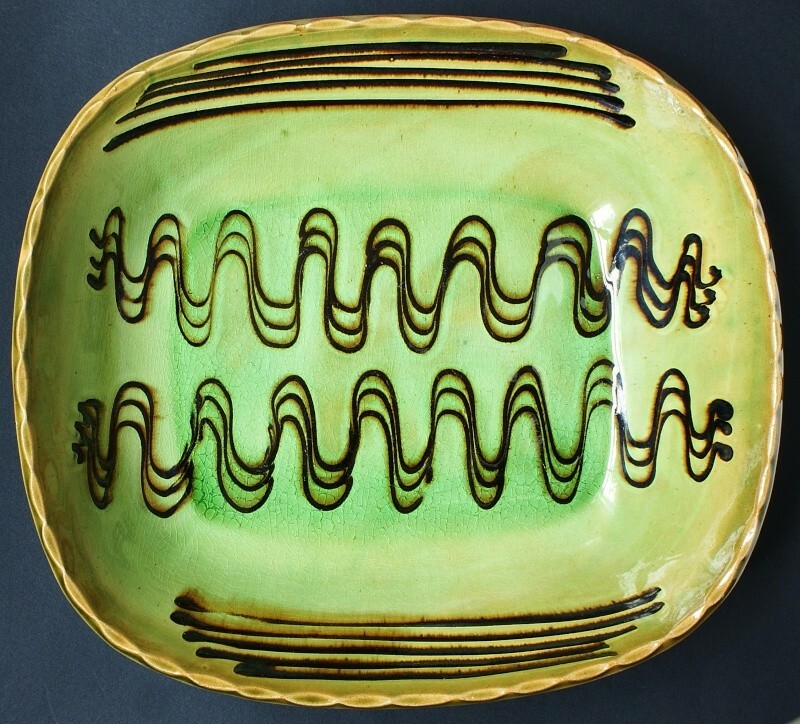 Broadway worked from 1959 to 1969 making slipware under the direction of A.E.Wheeler about whom nothing is known – who he was, where he learned pottery and where he went after winding up the business. Broadway appears to have specialised in little pots like the one that started me on this quest. From the marks on my honey pot, it appears to have been made in a mould. Muriel Tudor-Jones and Jo Berryman worked there. 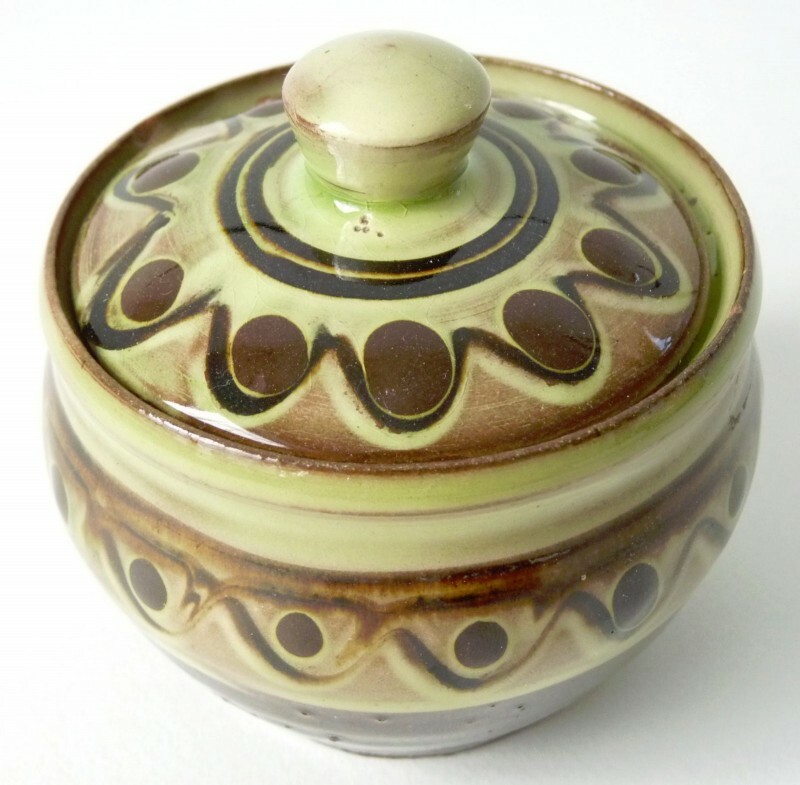 Muriel Tudor-Jones Set up Campden in 1963, making pottery like that of Broadway, but she introduced coloured slips. Her first artistic occupation was silk painting, then from 1947 she worked in several potteries, including Harry Davis’s Crowan Pottery in Cornwall. Davis was noted for the speed and accuracy of his throwing and his dislike of artistic posing. Coldstone and Broadway, where she also worked, were equally down to earth potteries. 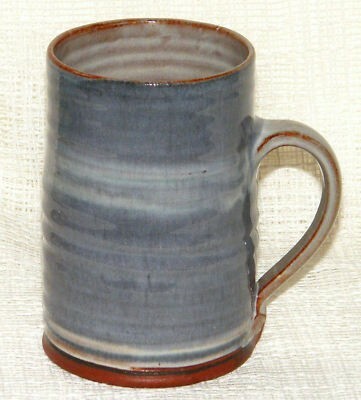 Mug by Muriel Tudor-Jones, Campden Pottery. She introduced a wider range of colours. “I worked for Muriel for two years before starting a pottery in Deddington, Oxfordshire. Before working at Chipping Campden, I was trained at Coldstone pottery in Ascott-under-Wychwood and Muriel had previously worked there too. Coldstone made traditional slipped earthenware but Broadway pottery and Campden used coloured slips – blue, dark and light green, “mink” and iron red decorated with white slip. 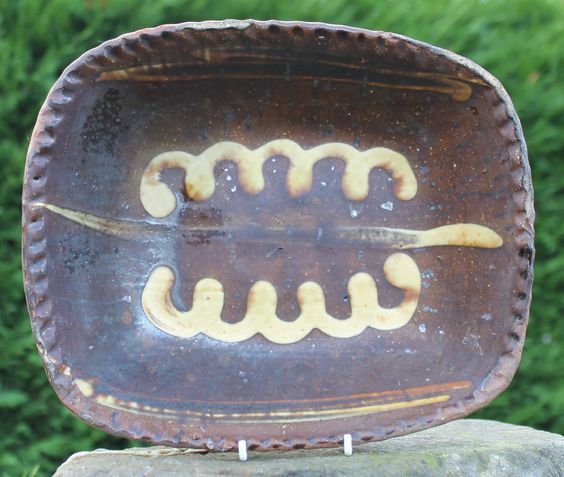 Dish by Jo Berryman, Deddington Pottery. Courtesy of the artist. “Campden Pottery also had a shop where we sold many different crafts – chairs, wooden toys, jewellery, some fabrics and baskets. At the rear of the shop up some steps Muriel could be seen throwing pots on a wheel. The rest of us were in a workshop at the back where the kilns were. Many of the thrown pots were decorated while still on the wheel with thick brushed slip and slip trailed. I was trained as a thrower but also made moulded dishes sometimes. There was a lady called Jill, I think, who made dishes and who learned to throw after I left, Jean who came occasionally, and Mr Mayo who pugged the clay. The shop was run by Mrs Hart. It was a lovely place to work and we all got on well together. There was one other character at the pottery: an elderly lady gave us a parrot named Jomo who sat in his cage and kept us all entertained. He had a large vocabulary – no swear words – and an hysterical laugh. Great fun. “After Muriel retired the pottery and house and flat were sold, which was a pity as there was no one able to take it on. Honey pots were also a staple of the Evenlode Pottery, and for several years they were able to keep their heads above water by selling as many as they could make to a honey importer. Coldstone, Campden and Evenlode closed when their owners retired. Broadway was wound up. Taena still exists, making slipware in the Cotswold tradition. Jo Berryman moved on from Deddington and continues to make pottery in Hampshire. Winchcombe continues under the direction of Michael Finch, Ray’s son, making what Ray liked to call useful pottery. THANKS to John Jelfs of the Cotswold Pottery, who identified my little pot and gave me useful information about the potteries; to Jo Berryman, who gave me her reminiscences of Broadway, Campden and Deddington potteries; to Dinah Kunzemann who wrote to me about Evenlode; to the Chipping Campden History Society, who sent me copies of documents in their archive, including the photo of Muriel Tudor-Jones; and to Margaret Brampton, who reminded me of Snake Pottery.